Navitsky will be formally presented with the Linn H. Enslow Memorial Award from the non-profit New York Water Environment Association (NYWEA), a statewide organization of leaders in water quality management, at the Association’s annual meeting on Wednesday, Feb. 6, in New York City. The Enslow award recognizes an individual outside of the NYWEA membership for an outstanding technical paper presented at an Association conference and/or published in a professionally recognized journal. Navitsky is being honored for his presentation titled, “Algal Biomonitoring Documenting Water Quality Impacts on Lake George,” which was presented at NYWEA’s 2018 spring meeting. As Lake George Waterkeeper, a program of The FUND for Lake George, Navitsky develops and implements programs that use an engineering- and science-based approach to protect the natural resources of the lake and its surrounding watershed. His presentation documents how the types of algae found in near-shore areas can help elected officials and residents understand the impacts of nutrients and develop prioritized management plans. This type of biomonitoring has been applied on Lake George in measuring improvements from the addition of an onsite wastewater treatment system and septic system replacement program at Dunham’s Bay (Town of Queensbury). 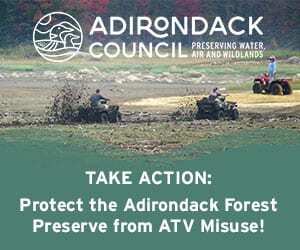 It has also been included as part of a prioritization map identifying those areas of the Town of Lake George in need of remedial action to protect the lake from septic system contamination. Navitsky was named Lake George Waterkeeper by The FUND in 2002, and is one of more than 300 members of the Waterkeeper Alliance worldwide. In 2005, he was named Conservationist of the Year by the Adirondack Council. Prior to joining The FUND, he worked for 16 years as a consulting engineer focused on site development and municipal engineering with strengths in wastewater design, stormwater management and erosion control. He is a graduate of the State University of New York College of Environmental Science and Forestry at Syracuse University, and a licensed engineer in New York and Pennsylvania. Navitsky lives on Sabbath Day Point in Silver Bay with his wife and 11-year-old daughter. For more information about the FUND for Lake George, visit their website.